Injury-hit but on a roll after drawing an engrossing Test series and winning the only Twenty20 match of the tour, India now get a chance to try different combinations before next month's World Cup when they take on South Africa in a five-match one-day series starting in Durban on Wednesday. Dubbed challenging to start with, the African safari has been reasonably successful for Mahendra Singh Dhoni's men, who avoided a Test series loss in the country for the first time earlier this month. But there have been problems to deal with and they have mostly been about players' fitness. Already missing key players such as Virender Sehwag and Gautam Gambhir, the injury list has only grown longer with the pace duo of Praveen Kumar and S Sreesanth in doubt due to hand and elbow problems respectively. It is the final ODI series that India and South Africa play before the World Cup starting February 19 and both the sides would look to settle their squads for the big event through these five matches. The series is a golden opportunity for the likes of Rohit Sharma and Suresh Raina to make a case for World Cup selection. They did well for themselves and the team by guiding India to a fine 21-run win in the Twenty20 match on Sunday with valuable batting contributions. The absence of biggies such as Sehwag and Gambhir now gives them an opportunity to hog the limelight in the ODIs as well but also creates the pressure of performing and performing consistently. Tendulkar to the Indian one-day fold after close to a year. The last time he played an ODI, Tendulkar became the first batsman in the history of the game's format to strike a double hundred. The opposition in that historic match at Gwalior also happened to be South Africa and Graeme Smith and his men would be praying that the champion batsman does not do an encore. For the off-colour Yuvraj Singh, it is the final chance to convince the selectors that he is the same destructive force, which won India many a matches before the stunning slump of form. On the bowling front, the ever-reliable Zaheer Khan will spearhead the attack after being rested for Sunday's Twenty20 international but his back-up seems a little weak given the uncertainty over the availability of Sreesanth and Praveen. In case the injured duo is ruled out, Ashish Nehra and the rather inconsistent Munaf Patel would be the options for India. Harbhajan Singh will as usual shoulder the spin responsibilities. 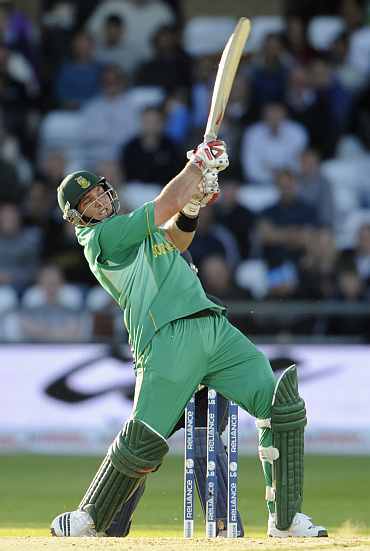 South Africa, on the other hand, would be, missing prolific all-rounder Jacques Kallis, who is nursing an injury. The veteran has been the rock around whom the South African batting has revolved as was evident during the drawn Test series. But the Proteas still have a good batting reserve with skipper Graeme Smith, the explosive duo of AB de Villiers and JP Duminy and the consistent Hashim Amla to anchor the middle-order. As for bowling, Dale Steyn has been in red hot form and has Morne Morkel and Wayne Parnell as his speed partners. All eyes will also be on the 31-year-old Pakistan-born spinner Imran Tahir, who is expected to make his debut after getting South African citizenship a few weeks ago.